The body is an extraordinary construction which is generally symmetrical, one side to the other. However, it is not exactly symmetrical and there may be entirely normal distinct differences between the two sides. 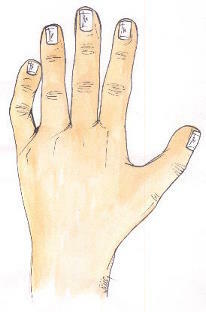 In the hand there are some conditions that can cause 'funny looking' or 'bent' fingers. These are true deformities and not like a trigger finger or a Dupuytren's contracture. They commonly affect the little finger and fall into three main types. Whilst these conditions are worrying for the parents, most children are unaffected both functionally and to begin with, emotionally by the deformities. The exception is usually a teenage girl, who becomes very conscious that the finger is not straight and therefore cosmetically it is a 'disaster'! 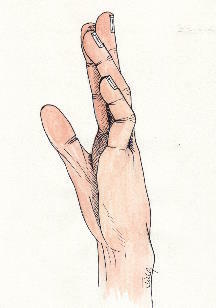 Sometimes there is a family history of the 'funny finger'. 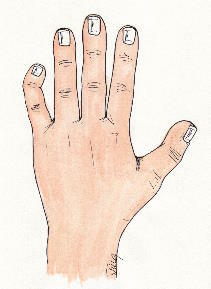 Camptodactyly involves the metacarpo-phalangeal (hand/finger junction) and proximal inter-phalangeal joints. Clinodactyly involves the proximal inter-phalangeal joint only and Kirner's affects the end joint, the distal inter-phalangeal joint. As the vast majority of 'bent fingers' do not cause any functional problems, there is little need for surgery. Most of them can be controlled by night-time splints and these are fitted by the Hand Therapists. As the child grows they will require adjustment and the splint may need to be worn for several years. Rarely camptodactyly can occur very rapidly and sometimes there is a place for surgery in this situation.